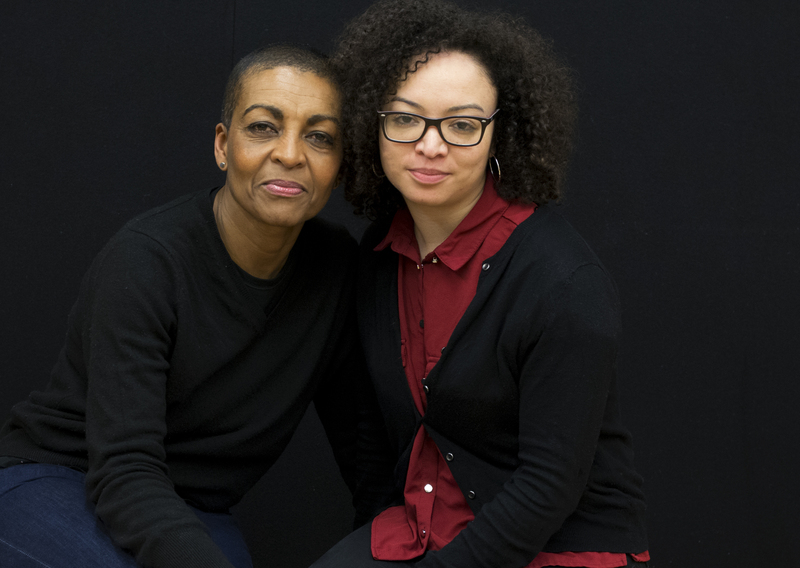 Powerful and inspiring these two women need no introduction, so what we have is an accomplished actress/director of radio, stage and screen with considerable years of experience, a well-known and respected/celebrated face on British television that is Adjoa Andoh. Then there’s the dynamite mind of a gifted theatre maker who now sits at the helm of the Bush theatre as Artiste director, some might say she has the Midas touch lending her vision to one successful production after the other that is Lynette Linton. Put the two together and it explains why there is more than a little excitement surrounding the much anticipated and upcoming production of Richard II at The Shakespeare’s Globe. Richard II has an all-female cast and they are all women of colour as Adjoa explains “when we say women of colour, we mean women of colour from across the Empire, so, from China to Iran to Pakistan to Jamaica to Guyana to Ghana you know we’re talking across the Empire”. Adjoa takes the title role and co-directs with Lynette. Richard II marks the beginning of a cycle of history plays that will provide a unique opportunity to rediscover how Shakespeare perceived ‘this blessed plot, this earth, this realm, this England’. Alt A caught up with Adjoa and Lynette on their lunch break at the Shakespeare’s Globe. AA: Please tell us a bit about the production Richard II how it came about. And you know, how open were the Globe to this production? Adjoa: “They were very open actually. I went to see Michelle Terry who runs the Globe about something else that didn’t work out. But she suggested I take a look at Richard II. So, I went away and read it, came back and said that I think it would be fantastic to do because it’s about England and it runs over the period of Brexit or not Brexit it depends when your reading this. So, I said I’d like to do it with all women of colour. And she said who would you like to play Richard and I said me. It is too good a part to give to somebody else. And she said what and direct it, are you mad. And I said no I’m not mad. I have a very very good and dear friend Lynette Linton who is a superstar director who I’d love to co-direct with. We worked together on a play at the Gate and now she is the Artistic Director of the Bush. And she’s just had this smash hit play called Sweat at the Donmar, she’s on her top game. Myself and Lynette we love working together I guess we just get each other. Our taste is similar, and we say what we want to say to each other, it doesn’t mean we don’t love each other if we hate each other’s ideas”. AA: You kind of covered some of my question about what it is like working together. But you mentioned an all-female cast and of course women of colour. So why is this momentous? Adjoa: “This play is all about England, St George, yeah, the flag of St George which is mentioned in the play. It’s got all those wonderful speeches, you know all those things that make people go slightly teary eyed and misty about this country. And my feeling has always been who is this country. And it’s a huge question especially at the moment with the whole Brexit thing, with Windrush you know there’s a lot of things going on at the moment that are really challenging. What is our notion of who we are as a nation? And for me I really feel like we built this nation, the Empire of which this country is now the reduced project that’s left was built by the people that this country went out and colonized. So, who’s at the bottom of that pile? Women and people of colour, so women of colour. It’s our time it’s our turn to tell the story of Empire in this play because our voices are never heard, and we contributed to the wealth and prosperity of this nation and we don’t usually get the chance to be part of that. So what we wanted to do was make a really clear offer. When you say everybody come and see this story, everybody should feel welcome to come and see this story, the story we are going to tell”. Lynette: “And as artists we are going to take up space, you know we’re going to take up spaces that we might not have done before and own that space”. Adjoa: “And yes, and it works on so many different levels. Creatively I can’t tell you what a beautiful thing it is to be in a room full of women of colour. And what I say when we say women of colour we mean women of colour from across the Empire, so, from China to Iran to Pakistan to Jamaica to Guyana to Ghana you know we’re talking across the Empire”. Lynette: “So you know what is lovely about that is you are in the room and it’s all of us together and then every day something happens that I would go if this happens tomorrow you may support each other. And we are in make-up talking about things and telling stories”. Adjoa: “One of the beautiful things I really love about this is because we’re all women of colour you can stop thinking about representing and just be in the room as an artist but you know at the same time you’ve got this huge…..we’ve got this huge breadth of understanding about what it is to have parents who have come from somewhere else or to have come from somewhere else yourself. To have grandparents having grown up under colonization you know, to have great grandparents that remember slavery and all those continents because it is not just from Africa. You know all that and to be dealing with children, to be dealing with aging parents, to you know all those things but to come into that room and just let it go, you come in and be an artist. And work with one of the greatest artists you can, I mean Lynnette. Because you know I think people can see this play as you know it’s sort of heritage Shakespeare or it’s only Shakespeare and you know white blokes in roughs and it’s not because you go back to Shakespeare. Anybody that writes on a heartbeat loves people cares about human beings”. Lynette: “This is what’s been so unique about this experience with me and I’ve said it loads of times. People wouldn’t say this, but Shakespeare has always scared me as a director. So, to be in space with Adjoa to watch it and see what we’re creating to be able to understand it through language and through the conversation and not be scared of it. So, don’t be scared to come to this building and watch Shakespeare, watch Richard II a play you might not have studied at school. You know what I mean come in watch it because you will understand it and you love it, hopefully”. AA: How much of the original text have you changed or adapted to suit the all female cast? Adjoa: “We’ve kept everything in..I mean OK I’ve done cuts like you would do cuts as any director directing Shakespeare anywhere because you know how many hours do you want to sit in the theatre. There are cuts, there are artistic cuts that are about shaping the narrative for the space we have got on stage the number of actors in the production and to how much time we can have. But in terms of going Oh it’s for women or these people of colour so we need to change it no no no. So our approach is don’t come in and play the characters as men or women come and play the person because actually what weighs us down so much of the time as human beings who we are women of colour is the judgments people make about out gender or our race and the values they put on those judgments and what we want to say in this production is come and sit and watch the people, watch their fears, watch their loves, watch their ambitions, watch their insecurities, just watch the people”. Lynette: “Feel the story. Yeah you know all that, and all of the other stuff on top it is about the story, it’s all back to what we talked about making it for everyone. And if you can follow the story and understand the story you know, you can pour yourself into that stuff and really enjoy it and that’s what we have to do”. AA: How easy is it to switch between playing Richard II and co-direct? Lynette: “No no it’s not stupid because you are doing really well, this is the truth and I think that it’s really lovely to have the moments when you are fully directing and the moments we have you on stage you are doing both really really well. I have not said that yet”. AA: So, you touched upon identity and you mentioned Brexit. How does the production deal with identity and address the conversations that we’re having now? Adjoa: “You know what just the physical, just the physical sight of all these women of colour just telling the story being excellent on their Shakespeare and the way we set it culturally I mean if you can tell me anywhere in the world, tell us anywhere in the world where of women of colour are in government and in power as a group. I don’t believe anywhere like that exists because it doesn’t, the world that we’ve created we’ve created from the cultural heritage of the bodies on stage. We honour the ancestors. That’s common to all our cultures. And actually, you go to Buckingham Palace and you know everyone on the walls are their ancestors. Yeah. So here the ancestors we all honour they are not the Duke of something. They are our people, our grandparents, our grandmothers, they are our great aunts, the people that made it possible for us to be here. So, in terms of identity those are the sorts of signifiers. We’re not laying any huge great political statement on top of the ten narratives we are telling the story as is. But it’s just that the context in which the story is held may feel slightly different from your normal storytelling because the antecedents that we’re referring to you know don’t look like Edwards IV or the Black Prince”. AA: So, a couple of quick questions, in terms of co-directing, what’s it like working together? Lynette: “We know each other so well. And what is the word, in the most beautiful and loving way is we are lumbered with each other”. Adjoa: “It is true actually there is a freedom in it”. Lynette: “We know each other’s strengths and weaknesses. You know I really trust Adjoa and I think she trust me. I mean it’s… it’s a learning curve”. Adjoa: “Well, you know I mean we laugh a lot. Yeah I mean we muck around a lot, we dance we laugh. So that’s what’s really nice about it. I think it works because we respect each other artistically because we are both good at what we do”. Lynette: “And we don’t suffer fools. It is so lovely that energy you know, it’s a safe place and we try things and people offer and that’s the most important thing in making a show is collaboration, offering and the conversation and trying things if it doesn’t work it doesn’t work”. Adjoa: “Also you can feel there is something very lovely that the space feels free enough for people to feel bold and to try stuff out, who cares if it doesn’t work. You know, try it and it’s all love. If it doesn’t work we’ll try something else. AA: Lynette congratulations on Bush Theatre, Sweat and your company Black Apron is doing the Windrush Passages tell us little bit about that and today the deportations? Lynette: “I think about it a lot actually because I think it’s what’s going on in our country again are the reasons why we are doing Richard II it is because of those conversations. And the reason why I wanted to do something about this because my dad is Windrush generation. And I feel like we not talking about it enough I was just like what is going on why we aren’t doing anything. And I have spoken about it a lot and just said the reason why we make art is to respond and to represent and to have these conversations. So, the Windrush event at the Royal Court is part of that conversation. It is not enough, there’s still not enough happening. But I think Richard II it’s a part of that conversation as well”. Adjoa: “My father is also Windrush generation. Was it not interesting when David Lammy talked about Windrush in the House of Commons he quoted Richard II. I just think we’ve just got to get into all the areas we can keep this up. It just feels like for too long we’ve just kind of accepted that some people value us somehow as somehow less, because of what? Because of this (touches her skin) what has that got to do with your character. It is heart-breaking”. Adjoa: “The other thing is with all these things I think that it is our duty to stay alert. We are artists I’m not a politician and I’m not a biochemist. I’m an artist. I’ve been doing a radio series on Maya Angelou, all her autobiographies at the moment and when you look at the life she had from going to live with her grandmother as a slave, her grandmother’s family as slaves in Arkansas and then the life she had with Martin Luther King and Malcolm X and going to Ghana when it was first independent and James Baldwin and all the people she knew in her life and how inspiring she was and then she inspires another generation we just have to keep handing on the baton. We just have to keep doing the work because that’s how we honour the people who survived before us and that’s how we try and give a hand up to the people who are coming next”. AA: “So one final question what you will want the audience to take away from the production”. Lynette: “Which is exactly what I always say I don’t think it is up to the director or an actor or a creative to say take this, you come in and you take what you want”. Adjoa: “Just like William Shakespeare makes no judgments with his characters he lays them out and he says you bring your heart, you bring your baggage, you bring your judgments to it and take what you take”. Lynette: “Exactly. And I think that what would the best type of show is when you can ask 10 people and they can all feel slightly different”. Adjoa: “The only thing that we can do is make the offer and try and make people welcome. The cast and production of Richard II deserve a mention big names and talent, Writer: William Shakespeare, The Ensemble Adjoa Andoh Director / Richard II, Lou Au Musical Director / Flute / Bassoon, Rianna Azoro Costume Supervisor Rosie Bergonzi, Percussion Giles Block, Globe Associate – Text Nicholle Cherrie, Green / Percy / Groom / Queen’s Attendant, Dona Croll John of Gaunt / Duchess of York, Sylvia Darkwa Ohemeng, Deputy Stage Manager, Ayesha Dharker, Aumerle Tess Dignan, Head of Voice Yarit Dor, Movement and Fight Director Cynthia DuBerry, Bagot / Ross/ Exton/Gardener’s Help, Leila Farzad Queen, Shobna Gulati Duke of York, Hazel Holder Voice, Sarah Lam Duchess of Gloucester/ Bushy/Willoughby/Gardener, Lynette Linton Director, Sarah Niles Bolingbroke, Indra Ové Mowbray / Northumberland, Sarah Sayeed Vocals/Tanpur/ Swarmandal, Rajha Shakiry Designer.